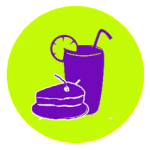 No doubt all that walking, riding or cycling will make you want to stop for a break and there are some truly fabulous establishments along the way that will offer you a warm welcome and a friendly smile. 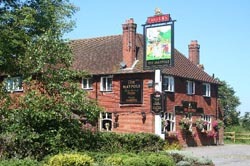 We are blessed with the high quality of these hostelries and we offer this totally independent guide to you without prejudice or influence. 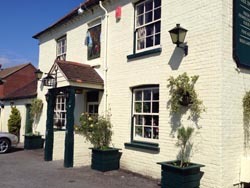 The Yew Tree, which stands on the border of North and South Hayling was once known as “Seamans” when it was a wheelwright’s shop. On this site the farmer brewed beer for his labourers and his family. It probably became an alehouse after the licensing laws were introduced. A macabre aspect of its history is that there was once a mortuary there where the bodies of drowned sailors were laid out after such disasters as the sinking of the Royal George off Spithead. It was bought by George and Douglas Henty the brewers in 1877 from Ralph Cutler. It was modernised in 1956 when its indispensable car park was added. 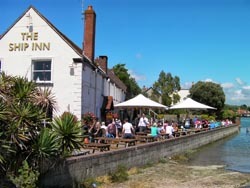 The Ship Inn started life as an 18th century wharf side warehouse handling grain. The original wheel can still be seen in the roof of the top deck bar. The Ship has had a colourful history and was said to have once been a smugglers haunt even though the village was formerly the Port of Havant and had its own customs officials only a hundred yards away.Today little evidence remains of the sunken lanes used to smuggle goods from Langstone to Havant. 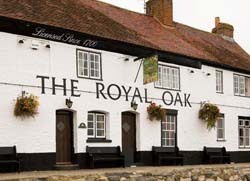 The Royal Oak One of the most iconic pubs on the south coast it is also one of the most painted as it is situated next to the picturesque mill in the Area Of Outstanding Natural Beauty that is Chichester Harbour. In front of the pub one can see the historic and antiquated wadeway which since Roman times was the only crossing to Hayling Island until the Railway Engineers decided to build their bridge. The Hayling Billy simply cannot be left out of this guide even though it is slightly further to walk from the trail. Opened in 1965 shortly after the railway closed it was named after the line due in part to the affection the Billy line was held in by the community. For years the pub had a rather nice visitor attraction outside the front door. 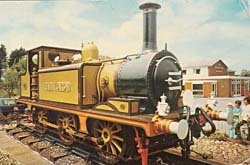 A Hayling Billy locomotive. 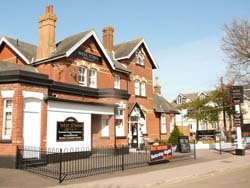 Built in 1867 in part Gothic style by the same architect who built the Hayling Station just 200 yards away the West Town aimed to capture the trade of the thirsty travellers disembarking at the end of the line. An early chequered commercial career saw the building for sale many times with one particular advertisement describing the locale as having “Oceanic air, clouds of ozone and glorious bathing”. Wow!